Suite Française was commissioned by, and is dedicated to, Val Brodie, the former director of Rugby Music Centre, with funds provided by West Midlands Arts, Rugby Borough Council and the Friends of Rugby Music Centre. Val specified that the octet should be for any sensible combination of woodwind instruments, but should not include any horns, as the Music Centre did not have any young players of a high enough standard in that academic year. As a former horn player, Guy found it difficult to consider writing an octet without horns, and many weeks passed before a note was written, while the commissioner and composer each argued the case for and against the inclusion of two horns! Val Brodie’s sweet reasoning finally won the day and Guy composed this charming octet for pairs of flutes, oboes, clarinets and bassoons. Rugby Music Centre’s Senior Wind Ensemble gave the first performance at the Rugby Youth Music Festival on May 22nd 1991, conducted by Helen Deakin. The atmospheric Pastorale is followed by a Waltz, the main melody of which is based on N’aï pas iéu de mîo, one of the Songs of the Auvergne. The finale, “Scène et marche”, is the most substantial movement and provides ample opportunity for each instrument to shine. The unmistakable Gallic slant to the melodic material and the general feeling of “joie de vivre” which characterises Suite Française no doubt betrays the suite’s origins in music which Guy Woolfenden researched and composed for two very different productions of Love’s Labours Lost for the Royal Shakespeare Company. 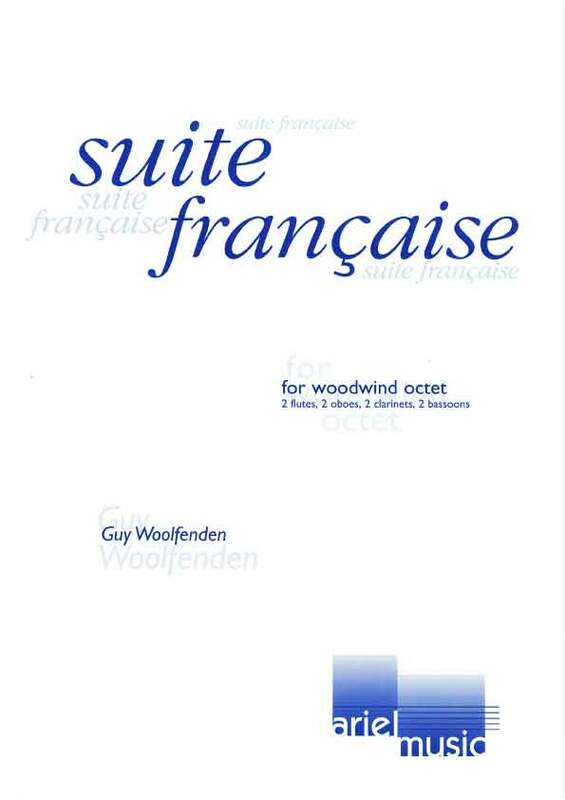 A warm welcome should be extended to the Suite Française by Guy Woolfenden – a delightful three-movement work for 2 flutes, 2 oboes, 2 clarinets and 2 bassoons. There is a shortage of good music for woodwind ensemble without horns and Woolfenden has provided us with a tuneful and well-crafted composition. The only work by a composer still living was a beautiful Suite Française by Guy Woolfenden, a composer with great theatrical experience and whose style this time was from the essentially Gallic sound world of Milhaud, while still turning pleasingly unexpected harmonic corners. Pared down to the numbers of David Rompani’s Woodwind Ensemble, it was easy for this performance to be musically the most satisfying of the evening.